If you are anything like me, there has been no break since the start of the holiday season last November. I owe Jenny a major apology as I agreed to be a guest poster on her blog what seems like years ago. One thing led to another and here we are – the Friday before Valentine’s Day and I can’t tell you how many ideas I had to make this right. One of the things I have always loved about Savour the Senses, is that this blog is not just sweets. Actually, there have been quiet a few ‘savory’ posts that I have salivated over. I mean this split pea gravy? That sounds crazy good. The creamy and beautiful chicken with spinach and roasted red peppers? If you have ever been to my site, Pass the Sushi, sure you’ll find a fair share of sweets, but my heart is in the real food. And after I read about her adventures in Africa, my heart was sold on Jenny’s site. How could I not want to live a little vicariously through someone so kind and full of energy? Line a 9-by-13-inch baking dish with parchment paper, leaving an overhang on two sides. Press the paper into the corners of the pan and lightly grease the paper with butter. Thanks so much Kita! Great to have you on my site! If you or somebody you know would like to be a part of Featured Foodie Friday please e-mail me at savourthesenses (at) gmail (dot) com and we can get you scheduled! I do love a good brownie! I have never tried mixing in cayenne before. 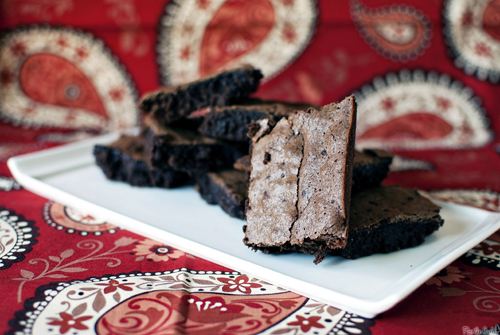 Thanks for a great guest post and recipe! Oh these sound amazing! When we lived in New Mexico one of my favorite wines was chile red. It was a bold dry red wine infused with chili pepper and it was fantastic! 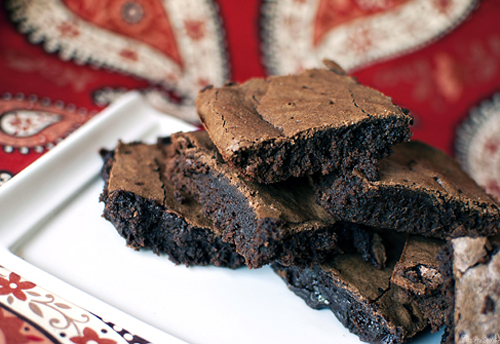 Now I need a trip to NM and these brownies! 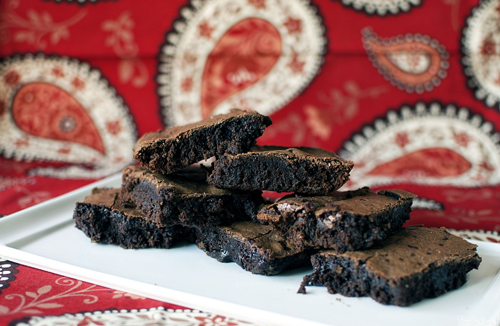 What a great recipe for V-Day—some spicy chocolate goodness to spice up the day! Love the combination of heat and chocolate! And wow! I am excited and nervous and jealous all at once! I bet it’ll be wonderful and he’ll love you. 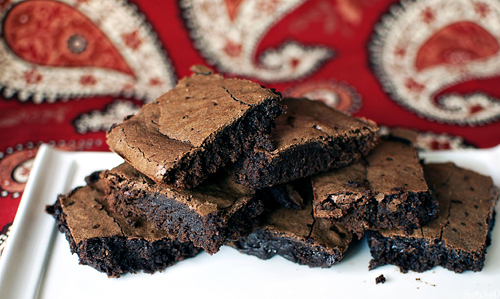 I love brownies. Great recipe. Wow–these look rich and delish! Love the idea of spicy chocolate. Great photography, too–a wonderful guest post! Oh, very spicy and you could make these again on May 5th! Chef Morimoto? I would be sooo panicked. Thank you so much for having me guest post for you and I am terribly sorry about not being able to share it faster on my site and facebook page. I tested the waters by not packing my laptop and found out that I really needed to lug the thing around. The kindle and phone just weren’t cutting it.